It’s a very simple spell, though costly. But it’s an instant, so you can cast it on your opponent’s turn when you’re not doing any other thing. So what can you search with this card? The list goes on and on… but I don’t want to make the list longer. And did you know what other cards you can find with it? 708.6a. 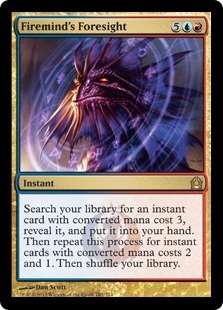 Anything that performs a positive comparison (such as asking if a card is red) or a relative comparison (such as asking if a card’s converted mana cost is 3 or less) involving one or more split cards in any zone other than the stack or involving one or more fused split spells gets only one answer. This answer is “yes” if either side of each split card in the comparison would return a “yes” answer if compared individually. Okay then… Far’s cost is 1U (2), and Away’s cost is 2B (3). Firemind’s Foresight is asking you to search for an instant card with converted mana cost of 3. Is Away an instant? Yes. Is Away’s converted mana cost 3? Definitely. You can take Away from your library, but you have to tag a long Far with it. You’ll get the card either way. So you can actually search for two Far // Away and one Wear // Tear from your library full of split cards. Great!